Teaching Guide. Edited by Enid Lee, Deborah Menkart and Margo Okazawa-Rey. 2006. 436 pages. Guide for teachers, administrators, and parents shows how to teach from a multicultural perspective that goes beyond the superficial “heroes and holidays” approach. Learn to work to dismantle racism in our schools, communities, and the wider society. 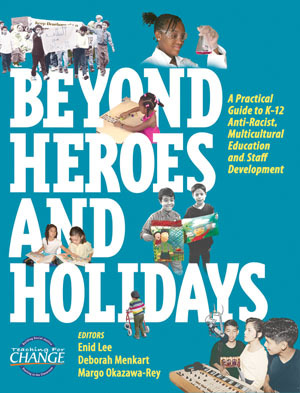 Beyond Heroes and Holidays has sold over 55,000 copies to date and is used as a core text in teacher education courses. Find free downloadable lessons and other resources at the Zinn Education Project website, search by theme, time period, or resource type. Beyond Heroes and Holidays is a must-have for educators at all levels… The editors use the philosophy of critical pedagogy, pioneered by the Brazilian educator, Paulo Freire to guide the book. 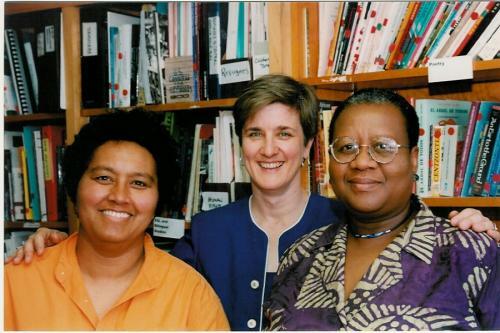 Infused within critical pedagogy is a focus on race and class-based inequity in education that analyzes multicultural education through multiples lenses and from multiple levels: the individual and personal (micro); community (meso); and the societal (macro). ISBN: 9781878554178 | Published by Teaching for Change.